The LG Enact is not the usual open-faced smartphone available in the market. Instead of the usual form that other smartphones are available in, the LG Enact is available in a slider form with a full QWERTY keyboard. The open-faced surface on the screen is a 4-inch touchscreen format wherein users can still enjoy their usual experience. While the LG Enact isn’t considered as a flagship device, it does offer something unique for its users. Apart from the convenience of usage, the Enact runs on a 1.2GHz dual-core processor and has an internal storage capacity of 8GB. There is an option to expand the memory by up to 64GB through the use of a microSD card. For taking pictures, the Enact is equipped with a 5 MP rear camera that also doubles as a full HD video recorder. It also has a VGA front-facing camera that helps capture self-portraits and make video calls. Upon purchase, the LG Enact runs on Android 4.1, which provides a remarkable user experience in enjoying apps and other tools. Through its 2460 mAh battery, users get to enjoy up to 216 hours of stand-by mode and up to 700 minutes of talk time. 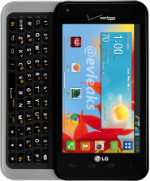 The LG Enact is available in black color only.